Our first gig of 2018 is set to be a sell out show, with only a handful of tickets left currently! 19-Twenty return to The Grampians on Thursday the 25th of January with their high energy, foot stomping punk-blues. We last saw these guys at the first ever Grampians Musical Festival in early 2017, and they definitely stole the show with their stage presence and energy. Not to be missed, and a fantastic way to kick off a long weekend. Book your tickets NOW if you don’t want to miss out, not many spots left! Click THIS LINK to do it, and we will see you there! 2017, A truly adventurous year! So it’s been a loooooooong time in between web updates.. Guilty as charged. I’m not sure how to justify this, I guess life simply gets busy and we get carried off with the adventures along the way! While the web updates have been infrequent, our social media has been healthily keeping everyone up to date on the ins and outs of Livefast Café life – so if you don’t follow us on Facebook or Instagram yet, I suggest you go have a peek! 2017 has since some great changes in the café, with a lot of staff coming and going, each person bringing their own personal energy to the business. We’ve had some great chefs cooking up amazing meals, and some fun along the way with incredible live music and staff fun days… I don’t think I’ve ever experienced anything more enjoyable than a staff member dropping out a plane on their first skydive! The business has continued to grow, even after seven years, and I have now been able to employ a sensational manager to help keep the creativity and quality high. A fresh set of eyes and new ideas go a long way in the constantly evolving café culture that is booming across the world right now. As a result of no longer being a one man army (well, I have always supported by a brilliant team of staff), I myself have managed to step back a little and focus on life outside of Livefast. Since its inception, I always wanted the cafe to be a reflection and collaboration of my work and life, a seamless balance between work and play. Having said that, it’s unbelievably nice to escape more often and enjoy some quiet time, or a sunset in the mountains. A little time away to help quiet the mind and focus on what’s important. A fresh perspective. We’ve been extremely lucky to enjoy so much amazing music this year, with artists coming from all over the country to share their passion and stories. It just seems to get better every single year, so a massive thank you to all our guests and customers for supporting live music and making it possible to invite such talent to the region. We have even more gigs planned for 2018, so watch this space to see who’s coming next! There isn’t much time left till we will be counting down the last few seconds of 2017, and I’m really amazed at just how great it was in the Grampians. It might be an overly sheltered little town, hidden from the stresses and hazards of the real world, but it’s a great place to call home – or escape for a weekend adventure. More and more local produce is popping up in the region, which makes it so much more rewarding (and delicious) for the kitchen team to keep bringing you such amazing dishes! 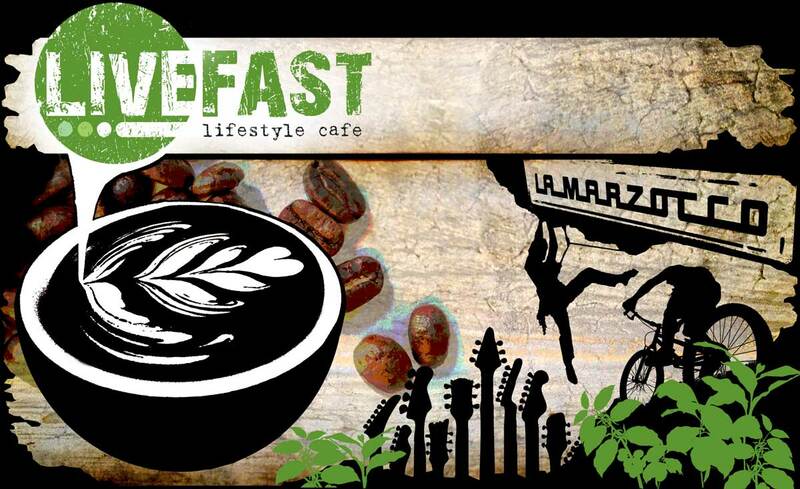 Craft beer, local wine, specialty coffee, it’s all part of the Livefast picture. Life’s far too short to not enjoy the finer things in life and take a risk when opportunities come your way. It makes me wonder what next year might bring.. I already know a few of the exciting changes we have planned for you all in early 2018, but what else might be in store? Where DOES the time go? And where do I begin on what’s been happening lately? What else is news? Well, the Livefast Coffee Crusier has nearly completed a cosmetic makeover.. Some of you may remember this at Run The Gap this year? A shifty looking blue 78′ FJ45 LAndcruiser adorned with a mobile coffee set up? Well we decided it was time to give the old girl a fresh lick of paint… Any day now she will be ready to start appearing at an event near you, in a fresh coat of gorgeous paint… not too far to go! A big thanks to Paul @ PJ’s Panels in Keysborough for the incredible work he does with restorations, big thumbs up to this guy! The Spring menu has been a big success too, we really are on a roll and spoilt here with options thanks to the fantastic team in the kitchen. Flavour is the spice of life and there’s some pretty amazingly flavoursome craft beer and local wine on offer, its a hard choice knowing what to put on the menu, but somebody must do the testing I suppose.. if I have to (he he he) After something different this month? How about a honey wheat beer from my temporary stomping grounds of Mildura. Food wise, Bron has been creating our seasonal menus here for the last 12 months or so, and does an amazing job of meeting my sometimes (ok, mostly) wacky demands.. We are lucky to have you Bron, its great to have you here making such a brilliant contribution to the café.. Jump across and check out our Spring menu! Pancakes anyone? I’ve said it before, but it must be said again, Caro, how do you come up with these cakes? Nutella cheesecake? Tequilla Lime Cupcakes? The girl certainly has a passion for baking, and it shows through in every cake that graces our cabinet… Very lucky café owner right here to be part of such a unique and diverse team. Do you see what I’m getting at? Four years down, and we have only made it this far thanks to YOU! The staff, the customers, the friends and the supporters! It takes a whole team of incredible individuals to get this far… So thank you guys n gals.. Its been a pleasure, and I look forward to what the future may hold! Love your work.. Will & the Livefast crew..
A brand new season is upon us, loving the thought of warmer days, swimming in one of our beautiful lakes, and maybe even knocking back a cold craft beer or two! As we kick off this month, check out our brand new menu (you’ll find it right here on the menu tab! ), with an updated wine and beer offering. While we are all about the coffee at Livefast, we also have a passion for local wines, craft beer, and the best local and regional ingredients we can get our hands on! Its time to start getting out and about as the days become longer, and the mercury rises! Don’t forget, this time of year is perfect for wildflowers, hikes, fishing, cycling, and just about anything you can think of to do outside.. See you soon everybody, its warming up! Great little snow fall we have had lately, it certainly adds some excitement to the air in this part of the world! It makes it just a tiny bit hard to slave away behind the coffee machine while everybody else is frantically flinging snow balls at each other on top of one of The Grampians highest peaks! I’m fairly sure we all managed to sneak up the hill at some stage though, and it truly was beautiful, and quite amazing to see just how much the mountains transform with a sprinkle of snow. Spectacular and breathtaking, I love it! After a three month break, we kicked off our monthly open mic night on the 31st of July. It was great to see it back in full swing, with a full house of guests and a handful of local musicians turning out on the wild wet windy night. We are certainly very lucky to have such an amazing pool of local talent at our doorstep. I must say a massive thank you to all that attended! To keep things interesting on the menu, we tried our first ever ‘Ciders and Sliders’ night too! Sliders are simply mini burgers for those that havnt stumbled across this suburban trend yet. It was very fun and the chefs did an amazing job of designing these gourmet little treats, they can be fiddly at the best of times, so well done to Bron and Federick for pumping them out under the pressure of a full house! By the way, our lovely pastry chef Caro, who has been back to visit her home country of Germany, is back on deck and pumping out some sweet treats! All our cakes are home made, and Caro is doing an amazing job. She really has a passion for baking all things sweet. You have to get in and try some of my favourites, there’s Beesting cupcakes, Choc Ripple Cheesecake, Danish Dream cake, the list goes on! Thanks Caro for keeping the pastry cabinet so interesting and tempting, to a fault! On that note, I think I better go for a bike ride, run, kayak, or anything for that matter, its beautiful out here today and I have been sampling wayyyyy too many delicacies from this kitchen! What a view on Winter! Winter is here and despite the cold, its definitely one of my favourite times in the Grampians! The walking trails are virtually deserted, the scent of camp fire smoke hangs over the town, the mornings are fresh and the days sunny and crisp! Not a bad time to get out and explore! Speaking of which, one of our team has been doing just that. Amanda’s been up to Mt Rosea and back with one of our new keep cups and snapped this shot just for kicks! Its a pretty hefty hike, but the view is spectacular and well worth the effort, when will we see YOU up there? Do you happen to have any awesome photos of your very own Livefast KeepCup in a beautiful remote location? Send it through to us at info@livefast.com.au and we will share it up here on the site, we’d love to see them! We made it! Just in time for Run The Gap 2014! The Livefast Coffee Cruiser was a hit with everyone who attended, and surprisingly, I think the coffee from the little Brugnetti machine may even be better than what you will find at the café! Big thanks to our local legend Megan (centre) for helping out on the day, Ben (right) and I couldn’t have done it without you! Know what else is really cool? One of our newer team members has been cooking up a storm in our kitchen! Check out this for amazing, Bron’s Deconstructed Apple Pie! A whole apple stuffed with an Autumn fruit compote on a sweet pastry biscuit with a dollop of cream and drizzle of home made butterscotch sauce! We certainly have some talented crew right now! Yum!!!! Look out for our new Winter menu coming soon!! !